WordPress User Extra Field plugin enhances your WordPress installation by allowing to create extra user profile fields. Fields can be optionally showed on the register page, account page and more! 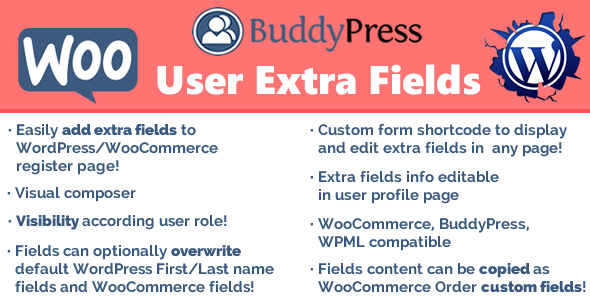 WordPress User Extra Field plugin is also WooCommerce, BuddyPress and WPML compatible! To receive automatic updates just install and configure the Envato updater plugin: https://goo.gl/pkJS33 .The official guide that explains how to configure it can be found in the following link: https://envato.com/market-plugin . fields the plugin uses nice calendar and time jquery componets to help users in selecting right values. With the file extra field, you can let you users/customers to attach files to their profile! This can be done during registration process or even during WooCommerce checkout process! Site admin can also limit file size and file types allowed to upload. Any file of any size can be uploaded! Give a try on the demo site! Would you like to show extra fields only for some user roles? you can! just enable the special option while configuring the field! every user (or site admin) can edit his info. For each fiend is also possible show its content directly in the embeded Users table and in the WooCommerce Customer Manager customers table, each field in its own column. WPUEF supports WooCommerce. Automatically adds extra field on the registration (optionally can be hidden). every field to be editable only in “Shipping Address” or “Billing Address” edit pages! Furthermore, Shop admin can also trace this extra info directly on the backend order detais page. have all the user and order infos under controll in one place! during user registration on checkout step. Note however that Extra fields will not be showed if the guest checkout option is enabled. In this case fields will be automatically displayed only if the ‘create account’ checkbox is checked by the user. The admin can also display two custom HTML snippets before and after the checkout extra fields form. Go to Settings -> Extra fields menu to configure those fields. native WordPress Custom fields meta box. In case of files, they will be deleted on order delete or if the custom field containing the file path is deleted. In this way each order will store the extra fields content submitted by the user during the checkout process independently by the actual values stored in the user profile! WPUEF gives you the possibility to store field content into the default WooCommerce billing and shipping fields. All the fields can be overwritten. You can optionally assign to Billing name, Shipping name and user first name (same thing can be done for last name) the same value. Just select one of the Multiple overwrite options in the dropdown menu. way you can keep an eye on all the user extra info at once! You can optionally set fild row size: half-size (left/right) or full width size! NOTE: this option cannot be applied to the “Country & State” and “Title” fields. It will have the full-width size. Optionally you can overwrite password field too. This can be useful if you want to allow weak password usage. Enabling this special option your customers will be able to register (and reset password on woocommerce reset password page) using any password, the plugin will override the default woocommerce password weakness check. This special field will be visible ONLY in the register page, checkout register form and optionally in the My account page. will be public viable in the user profile. Every user can edit those extra fields using their own edit profile page. WPUEF gives you the possibility to store text field content into the default Name and Lastname wordpress fields. To that you have just to create a text field and then check the First/Last name overwrite option. Would you like to display a field value for the current or a particular user? You can just using the [wpuef_show_field_value field_id=”” user_id=”“] shortcode. A “field_id” must specified and optionally can also specified a “user_id” paramenter. The “user_id” will let you to display a field value for a particular user, if left empty will show field value for current user. string(6) "My custom dropdown field"
string(2) "Label string for option 1"
string(2) "Label string for option 2"
string(2) "Label string for option 3"
var_dump($result->value); //Will print the user selected value for that field. that lets you to read/save a field in your theme or plugin (field id value can be read in the visual editor after field creation). On user deletion, every file attached is deleted too. The plugin hasn’t any feature to import/export via CSV field values associated to users. For that you have to use the following plugin: WooCommerce Customers Manager. * Fixed an issue related to the "add new user" via backend function.